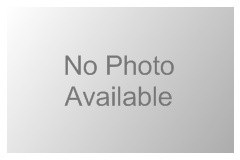 Generally including blks. Between N. Main & 3rd Sts. From Lincoln to Kansas Aves. & the W side of Kansas Ave. 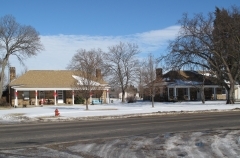 The Ellsworth Downtown Historic District is nominated for its association with the growth and development of the community from early cowtown days through post-World War II. It is also nominated as a collection of buildings representing a wide range of commercial architectural styles from vernacular one-part commercial blocks to 1950s Modern designs - from substantial public structures to traditional commercial buildings. Several of the district buildings are from the Late Victorian era, reflecting Italianate, Romanesque and Queen Anne styles. The town's financial institutions are among the few existing Classical Revival buildings, portraying an image of stability and permanence. 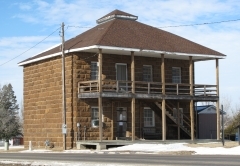 The Holyrood Santa Fe Depot was built in 1887 as the Santa Fe Railroad stretched west through Ellsworth County. 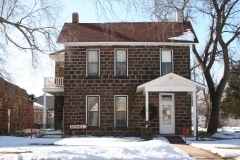 This vernacular building has vertical board-and-batten siding with simple Victorian characteristics that include eave brackets, a projecting bay window with a gabled roof, and multi-light windows. 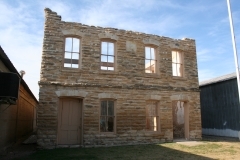 It served as a combination depot that accommodated both passengers and freight. Although no recollections have been found noting the depot's closure, local historians recall that freight service ended in the early 1980s. Its passenger service likely ended many years prior. 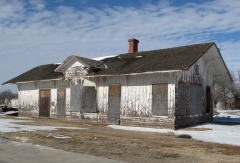 The depot is nominated as part of the "Historic Railroad Resources of Kansas" multiple property listing for its association with local transportation and for its architecture. Although listed in the National Register before the Kansas Rock Art Thematic Nomination, this is one of 30 American Indian rock art sites located in the state of Kansas. The majority of the sites are located in four counties in the central part of the state. 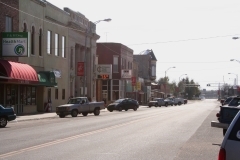 Smaller numbers are located in southeast and southwestern Kansas. These sites have examples of anthropomorphic figures and human-like forms, animals and animal-like forms, geometric designs, straight lines, and grooves. Several styles of anthropomorphic petroglyphs have been recognized. Previous analysis of a fraction of this rock art indicates it is the product of Indian tribes inhabiting Kansas during the protohistoric and historic periods of circa AD 1541 to AD 1870.